The discovery of Copper on the mountain required a means of export. 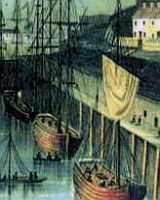 The small creek of Amlwch port had been used as a harbour for many years but was not sufficient for the needs of the new industry. Initially the Harbour was enlarged and developed to allow it to accept the larger ships that were required. The sea around Amlwch and the North coast of Anglesey was not at all kind to the vessels who used the Port. There are many ship wrecks around the area. A small ship repair industry was started which eventually grew into a ship building industry.